Auto-Tune SQL/MX Plan Analysis and Tuning Plugin | Nexbridge Inc.
We are now in production. You can download the software and try it for a limited time. Don’t forget to keep up to date to get all the latest features. SQL/MX Auto-Tune is a plug-in created by Nexbridge Inc. for ECLIPSE that helps developers and database analysts evaluate SQL execution plans specified in C++, COBOL, and Java code. With it, you can analyze existing plans, try out new plans, and evaluate the effects of CONTROL QUERY DEFAULTS on statements in your code. Auto-Tune maintains a history of your evaluations, so you can go back in time and see what changed in your plans. Explain plan comparisons, including graphical comparisons of multiple statements. Support for SQL statements in quoted strings (Java). Heuristics for automatically finding beneficial CONTROL QUERY DEFAULTS. 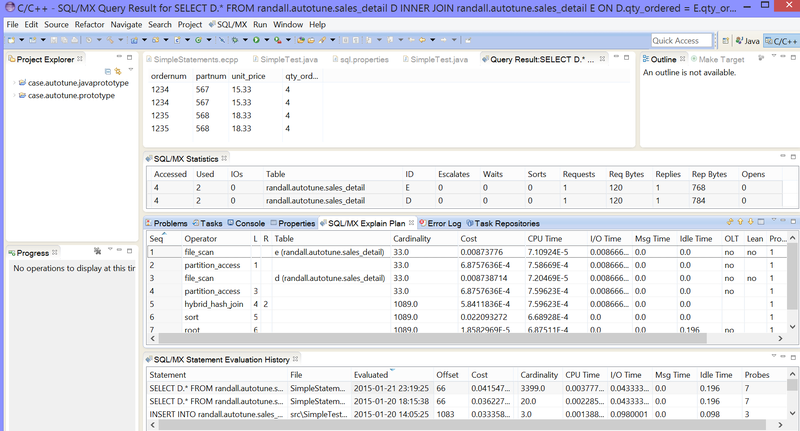 Wrap an SQL statement with the CONTROL QUERY DEFAULT used as part of tuning. Automatically download JDBC Type 4 Driver. Add an Update Site with the URL: http://www.nexbridge.com/Eclipse/Juno. Open the site and select the Auto-Tune product under Development Tools. If you want to perform analysis on Java code using JDBC, including custom queries in Spring and Hibernate, also select the Auto-Tune Java Connector under JDT Connectors. Open Windows/Preferences and select SQL/MX Auto-Tune to set up your server connection. Once ECLIPSE restarts, open your source code, then right-click and select the Explain Selection command to obtain SQL/MX Explain Plans. Auto-Tune is a commercial product subject to license conditions. You must have a valid up-to-date and paid-for license to use Auto-Tune. Terms and conditions apply. Auto-Tune licenses are available either for workstation or by bulk licensing. For volume discounts, product data sheets, and quotes, please contact your Nexbridge sales representative. To purchase a license, you must supply an Email address and valid MAC address on your workstation. This information will be used for licensing only. Once we have verified your purchase, we will send a license key to you via email.